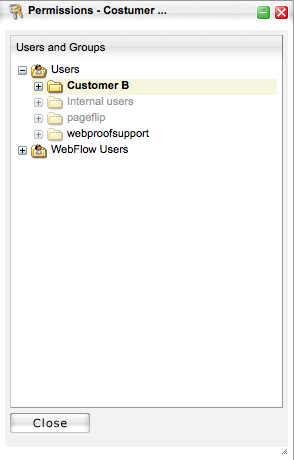 Creating Customer Folders under "Users"
All users are located under "Settings", divided in customer folders. When creating new customer groups (folders), right-click "Users" and select "New Group...". Name the new folder according to the customer name and click "OK". The customer is created in the "Users" folder. Note: Creating new group folders in root folder is not available in FREE WebProof version. See more about FREE setup here. Right-click the customer folder in which the new user will be created. Select "New User... ". Populate the fields in the displayed dialog. Note that "Username" and "Password" are case-sensitive and the password must be at least 5 characters. Note that duplicate usernames in WebProof are not permitted. It is important that the "E-mail" and "Mobile/SMS" fields are populated, in order to use the "Notifications" function. Country code must ALWAYS be populated. Assign a role to the user and click "OK". When created under "Settings/Users", the user can be attached to the required folder under "Projects". It is not possible to attach a user to a project, only a folder. When attached to a folder, the user will be able to see all projects and subfolders under it. The requirement for a user to be attached to the main customer folder or only the appropriate project subfolder varies from user to user and customer to customer. Right-click the folder to which the user will be attached. Select "Permissions". The list of users created under "Settings/Users" is now displayed. Find the user or folder to attach. Right-click and select "Attach". The user/folder is now attached to the project. A folder name in bold means that it is attached, which also means so are all users in the folder. A folder name in normal type means that not all users in the folder are attached. When the folder is opened, the attached users appear in bold text. A folder name in grey means that no users in the folder are attached. A folder name in bold means check!.